Just returned from a week in Edmonton, man I’m glad I am back in BC. It was a beautiful day today, 12 degrees with some sun and cloud. Although I didn’t leave the office all day it was still nice to walk outside and see trees and mountains. Anyway I would imagine your looking for a update fishing report so here it goes. 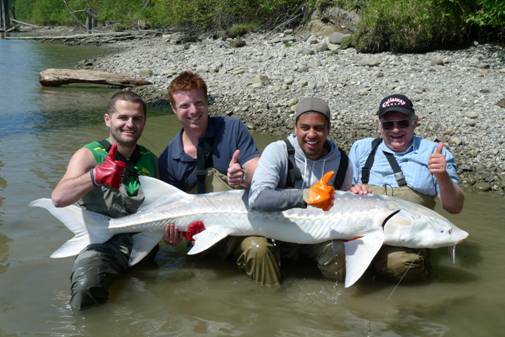 We had a large group out this past week, 5 boats with 22 anglers all trying to catch that monster sturgeon. Our Top boat for the day was Tom with 22 fish ( not a surprise) most of the other boats managed between 4 to 8 fish. A couple fish in the 6ft range but most of the fish were between 2 to 4 feet. Thomas has been out all week fishing sturgeon and most days resulted in 8 to 10 fish although the last two days was a bit slower. Best bait has been Ulichons and eels but a few fish also caught on salmon eggs. 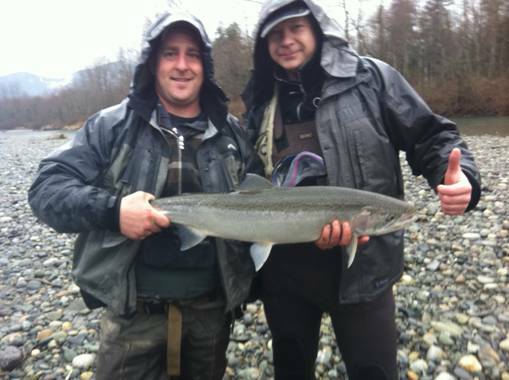 Steelhead fishing has been fair to good, water clarity has been a bit off but that is expected when we get this much rain. It was a beautiful day today so the river should be in good shape by tomorrow or Wednesday. Quite a few anglers have been trying their luck with the fly rods, some success but don’t expect the same results as you would get with using a bait casting rod and cured eggs. As water and air temperatures rise, steelhead will become much more aggressive making the fly rod a very useful tool. Remember to fish the run all the way through as more often than not, those bigger fish are holding in the tailouts in knee deep water. Well, the fishing remains good in our local waters. After a bit of a slow period in early February the fishing seems to be rolling along well with good catches by ourselves and local guides. Good numbers of winter springs are feeding actively in the harbour and we are also getting great reports from the Gulf Islands. This fishery will stay steady well into April as we have had some of the best winter spring fishing in the months of April and May. 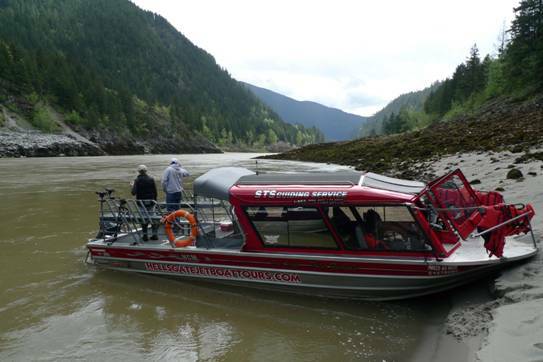 We will start to shift gears in late April and into May to more of an offshore fishery on the south side of Bowen Island and the outer reaches of the harbour for some of the early Squamish Springs. These bad boys are plentiful and can be BIG. 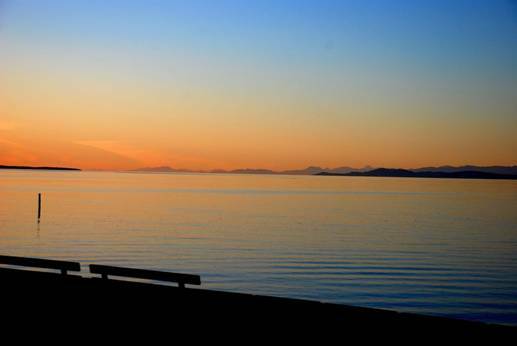 Gulf Islands will just keep getting better from now until June. If you are looking for a seafood safari give us a call and we will do our best to get you some salmon and crab for the table and a have a great time doing it. Our 28ft twin engine jet boat is out of storage and back onto the water. We are now booking for both spring and summer runs to Hells Gate. If your planning a trip with me in my twin, you better book soon as most weekends are gone and weekdays are going fast. We are also booking canyon sturgeon charters with me in the big twin so come join me this summer/fall for some great canyon fishing.